a lap behind. By this time the wind was really blowing, with gusts of up to 50mph and the event was in very real danger of being cancelled. Some teams were having to hold onto various parts of their bodywork to stop them from blowing away. By the end of the race, the wind had subsided slightly and despite the late start, we placed 10th. The third race in comparison was quite uneventful and the team used the opportunity to develop their driving skills and pit changes. Even so, we placed 8th at the final flag, which was our best time and position for the day. Coming back to Hull, it was downhill all the way and we managed the journey in just over two and a half hours. 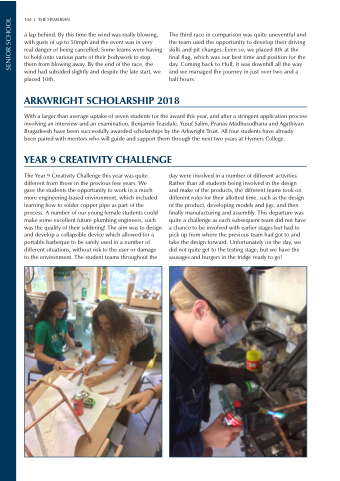 With a larger than average uptake of seven students for the award this year, and after a stringent application process involving an interview and an examination, Benjamin Teasdale, Yusuf Salim, Pranav Madhusudhana and Agathiyan Bragadeesh have been successfully awarded scholarships by the Arkwright Trust. All four students have already been paired with mentors who will guide and support them through the next two years at Hymers College. day were involved in a number of different activities. Rather than all students being involved in the design and make of the products, the different teams took on different roles for their allotted time, such as the design of the product, developing models and jigs, and then finally manufacturing and assembly. This departure was quite a challenge as each subsequent team did not have a chance to be involved with earlier stages but had to pick up from where the previous team had got to and take the design forward. Unfortunately on the day, we did not quite get to the testing stage, but we have the sausages and burgers in the fridge ready to go!